When I were a lad, pub food was very simple. Crisps, salted peanuts, pork scratchings and, if you were lucky, Pukka Pies. They sat in a heated display unit on top of the bar all evening until the pie fillings reached a similar temperature to the centre of the sun. You will have gathered from the existence of a hyperlink to Pukka Pies that they are still in business. I thought they went out with Whitbread Trophy, red formica tables and old blokes playing cribbage, but a quick Google search proved me wrong. They've modernised the product range since the 1970s, mind. 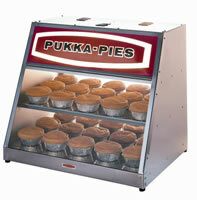 I don't recall peering into a Pukka Pie display unit in those days and seeing 'Luxury Halal Chicken Balti Pies'. Times have changed. The average British pub nowadays offers a much more elaborate menu. A beef and onion pie won't do (and neither will a chicken balti pie, 'luxury' or not). The punters can choose chargrilled chicken with mango salsa or Thai ginger fish brochettes. And why not? Our palates have become more sophisticated and pubs must raise their gastronomic game. But there are two problems with this development, and both are to do with honesty. If you watched Rick Stein's two recent Food Heroes series on BBC2, you may recall his frequent rants about the difficulty of finding traditional dishes or local produce in most British pubs and restaurants. In one programme, he arrived in Lancashire. "I couldn't find a hotpot in any pub, any restaurant, any hotel, anymore. You just think... what is wrong with this country!" While many pubs are anxious to promote locally-produced real ales in an effort to meet the modern craving for 'authenticity', their food rarely has any connection to the locality. Indeed, it lacks any sense of place (local or otherwise) but instead trades on a sort of free-floating faux-exoticism invented by pretentious marketing men. This ersatz cosmopolitan pub food also exploits the popular fallacy that, the longer the menu, the better. It's not that pub customers should be forced to eat local food, rather that they rarely have the option. The second form of dishonesty is less immediately obvious but is the likely cause of the first. The writer and critic Jonathan Meades once pointed out that, if you wanted to discover the British catering industry's dirty secret, all you had to do was look in the pages of its trade press. Most of the advertisements in these magazines are not placed by suppliers of fresh food but by suppliers of assorted ready-made culinary short cuts. Joanna Blythman's article in Wednesday's Guardian G2 supplement revealed the strong likelihood that your 'gastronomic' pub meal has come out of a packet. Most customers are oblivious and purchase their meals in good faith, on the reasonable assumption that the food on their plates is the result of some culinary skill applied to fresh ingredients in the kitchen. Pubs that re-heat industrially-produced processed food and present it as if it were freshly cooked aren't telling their customers downright lies (which would be illegal). But, by serving bought-in food that is essentially no different to what you could find in a supermarket chiller cabinet, they are being less than honest. And let's not assume that everyone wants freshly-prepared food. I can imagine there may be some customers who actually prefer a boil-in-the-bag dish, on the grounds that there is less a pub's chef can do to ruin it. Either way, people can make a real choice only if it is an informed choice. One of the assumptions behind classical economic theory is that, to achieve a perfect market, one must have 'perfect knowledge'. In other words, for the free market to function effectively, amongst other things, customers must be in full possession of the facts. When it comes to dining out, the simplest way to achieve this would be to oblige pubs and restaurants to declare on their menus whether the food is fresh or comes out of a packet (a task no more onerous than applying the widely-used vegetarian 'V' symbol), enabling consumers to make more informed choices. Such honesty would oil the wheels of the 'free market', surely? Ah, say the laissez-faire purists, but you can't do that because regulation is interference with the free market. Perhaps one of them could explain how many angels can dance on this particular pinhead? Meanwhile, say what you like about Pukka Pies, but at least the cellophane wrapping is removed from the product in front of the customer. So what've you got against the Chicken Balti Pie, you peasant? I'll sub you a ticket for City vs Bolton on the Sunday of Conference. The accommodation is more luxury than Blackpool. Oh, and if City sell out of pies, they lose. That's all very well, Gareth, but are Manchester City's pies Pukka? And to claim that "the accommodation is more luxury than Blackpool" is not saying much. "If City sell out of pies, they lose"? Logically, then, City's chances improve the fewer of their supporters turn up.